Why do people pass? Fifteen writers reveal their experiences with passing. For some, “passing” means opportunity, access, or safety. Others don’t willingly pass but are “passed” in specific situations by someone else. 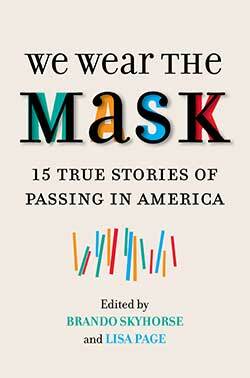 We Wear the Mask, edited by Brando Skyhorse and Lisa Page, is an illuminating and timely anthology that examines the complex reality of passing in America. Skyhorse, a Mexican American, writes about how his mother passed him as an American Indian before he learned who he really is. Page shares how her white mother didn’t tell friends about her black ex-husband or that her children were, in fact, biracial. The anthology includes writing from Gabrielle Bellot, who shares the disquieting truths of passing as a woman after coming out as trans, and MG Lord, who, after the murder of her female lover, embraced heterosexuality. Patrick Rosal writes of how he “accidentally” passes as a waiter at the National Book Awards ceremony, and Rafia Zakaria agonizes over her Muslim American identity while traveling through domestic and international airports. Other writers include Trey Ellis, Marc Fitten, Susan Golomb, Margo Jefferson, Achy Obejas, Clarence Page, Sergio Troncoso, Dolen Perkins-Valdez, and Teresa Wiltz.